LED throwies are simple home made illumination devices using a LED, a battery, some duct tape and a magnet. They were created mainly as a way to do urban graffiti but can also be used as simple illumination devices, trail lights and markers. The basic throwie model requires a 10mm LED (red pictured but other colors can be used), a 2032 coin cell battery (very common and easy to get), some duct tape and a magnet, neodynium magnets recommended. The construction is simple just make the LED legs contact the positive and negative sides of the 2032 battery, since a LED is a diode this will only work in one position. 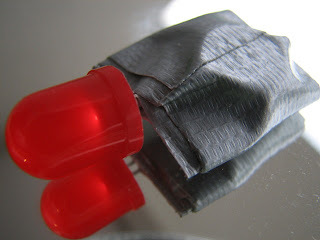 Stick the magnet to the positive side of the 2032 battery and wrap with ducttape. To use it just stick it to a metallic surface and voila!. Runtime for a simple throwie can be several days, with a red LED one week of runtime is normal depending on the LED used and the quality of the battery. If you want to use the throwie as a marker or locator you can use a small piece of paper to prevent the contact between the battery and the LED and remove the tab when you want to use it. Variations include the use of a photocell to turn on or off the LED based on ambient light extending runtime, adding a simple switch, use of 3mm or 5mm LED and smaller batteries to make it even smaller etc etc. For the ones that like minimalistic EDC you can always have one ready in your kit with a tab to prevent activation and use it when you need it, they are easy to do, can be made by children, fun to use and economic. 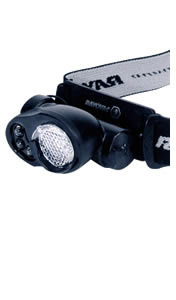 This is a light weight and small headlamp made by Rayovac using a single AA cell. The light has two 5mm red leds, one 5mm blue led and one 1 watt luxeon led as its principal light source. The headlamp has 3 modes that can be rotated using the single button switch, the first press turns on the two red leds, a second press turns on the blue led and a third press turns on the white led. The three modes are quite bright for a single cell lamp, reds are useful to preserve night vision and blue is good for contrasting when you need to find something, it can also be used for blood tracking and other activities where blue light is recommended. The white beam produces a good hotspot that can be used to take a night walk without any problems. Runtime is 2 hours for the white beam, we haven't tested the red /blue leds but we think runtime might be longer for them. As a distinctive feature the light has a difusser that can be used over the red/blue leds or the white led, since it rotates from one position to the other. The difusser makes the light produce a floody beam that is very useful for a task light, for reading and other activities where you need smooth beam without a tight hotspot. Balance is good and the up/down rotation is adjusted with a plastic ratchet. The ratchet is very solid and the assembly does not move when running. This model is probably not intended for outdoor activities but is certainly very good as a tasklight for indoors use or camping. Using just a single AA cell the light is very light and confortable to use. A very good option for a light tasklight or a backup headlamp. This model is available for about $20 at WallMart and similar stores, discounts might apply so you may find it at an even lower price. You can read more at Rayovac's website. Yet another presentation for a USB flash drive, in this oportunity in the shape of a wristband. 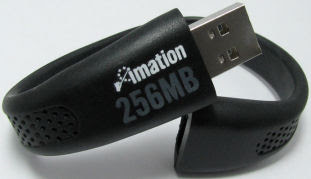 The Imation Wristband is basically a USB drive surrounded by a rubber band giving it the shape of a wristband. The USB connector is used as a buckle to secure the drive to your wrist, bag handle, backpack or other places. The band is not sizeable and measures 210mm (5.59'') so you have to make sure that it will fit your wrist in a confortable way. Being made of rubber and in only one size we estimate only a few will find the band confortable to the wrist. The idea is interesting but with the size of flash drives today one has to wonder why carrying it as a bracelet is a need or even a good idea, you can put today's tiny drives on your wallet, keychain, necklace and so many places that the bracelet might even be impractical and too geeky for your taste. The product is available in several colors and different memory sizes up to 1gb, probably bigger versions coming soon, it can be customized with your own logo too. You can read more at Imation's website.